Is It Wise to Follow & Bet on Picks from Touts and Sports Handicappers? Today I want to discuss with you whether it’s wise to follow and bet on picks from touts and sports handicappers. First, I want to talk to you about my big wins yesterday, and how that ties in directly to today’s theme of following the touts and sports handicappers. Yesterday, on my biggest day of the year where I had 2 picks of the week, a pick of the month, and a 3-team parlay of the month, I won each and every single one of those picks, PLUS I won 3 out of 3 on the Utah/Duke/Kansas St Round Robin and won on both of his 2-team parlays on the Bulls/Bulls Over and Bulls 1st half/Bulls Over 1st half to skyrocket up a total of +182.9 units across all programs! 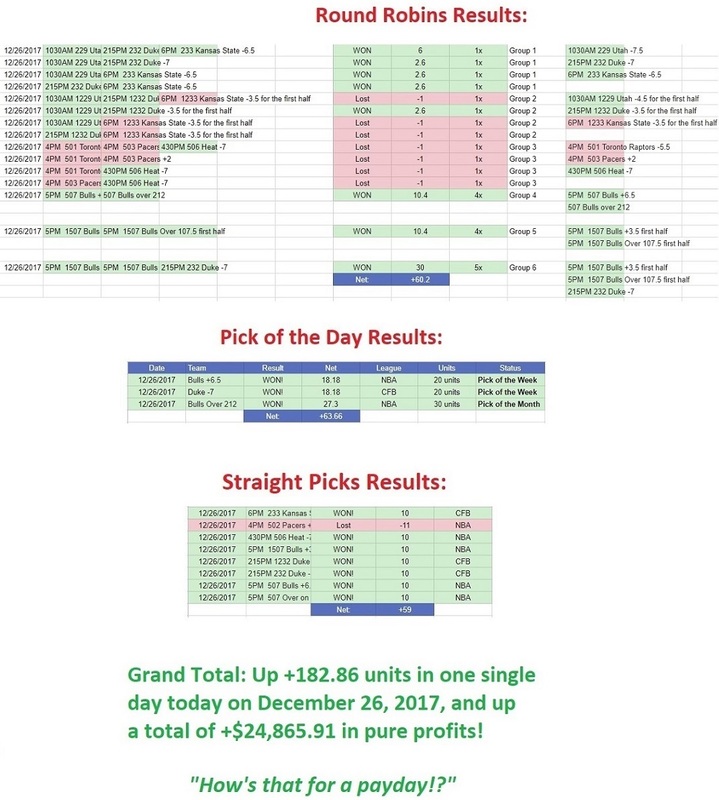 Overall for December 26th: Up +182.9 units! I cashed out like a rockstar. 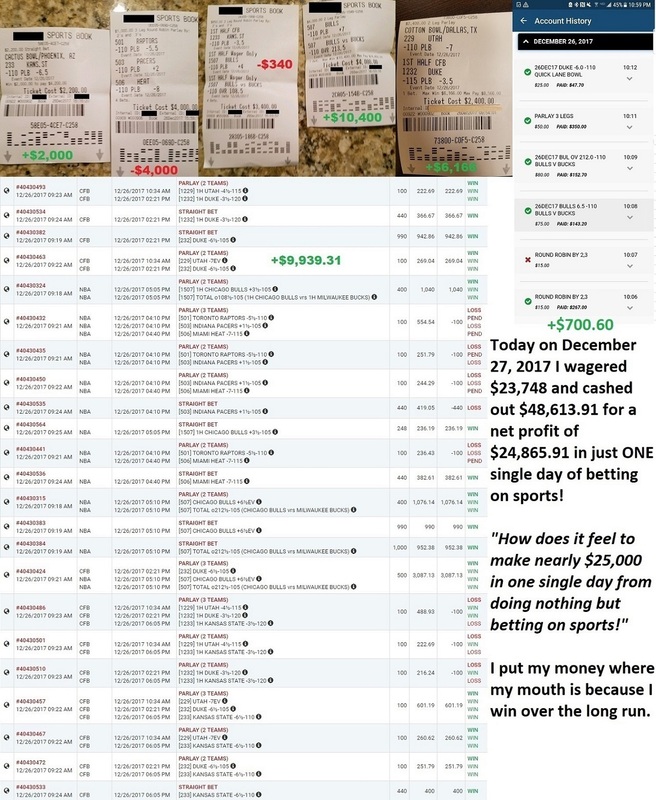 In one single day yesterday, I wagered $23,748 and cashed out $48,613.91 for a net profit of $24,865.91 in just ONE single day of betting on sports! And I had to really fight to get that $4,000 parlay because the sportsbook wouldn’t let me bet that much at first. They gave me a limit of just $2,000 on that ticket. I had to twist a lot of arms yesterday to get them to even raise my limit to a $4,000 wager. That’s quite a far cry from the 90’s and 2000’s when I was allowed to accelerate to max limits. Back in the old days when the Mirage sportsbook would allow me to bet $20,000 per parlay on Round Robins, yesterday is a kind of day where I could have won a million dollars in a day. And it wasn’t very uncommon for me to win big money like that consistently. I remember winning so much money at the sportsbooks that I even stopped caring about hundreds of thousands of dollars. One time, I remember the director of the Mirage sportsbook coming and said to me that they were missing several hundred thousand dollars in chips. I said that I suspected I must be having those chips, because nobody else in the casino was betting as much as I did. I didn’t think much of it. But one day, I happened to be looking around in my cabinets at home for some shaving cream. As I picked up a bottle….lo and behold…there it was: I found hundreds of thousands of dollars in betting chips that were placed behind a bottle of shaving cream in my cabinet. And up until then, I had no idea! I had no idea that I had hundreds of thousands of dollars just laying around at home behind a bottle of shaving cream because I had so many other millions of dollars that I won from betting on sports that I completely lost of track of some hundreds of thousands of dollars in chips just laying around the house collecting dust. Plenty of other times I’ve casually left tens of thousands of dollars laying around and forget about them. My friends will tell you about the times when I’d go put on a jacket and realized I still have tens of thousands of dollars in betting chips laying in my jacket pocket that I had no idea I left them there. Other times, I won so much money that there wasn’t enough ways for me to spend it. I’ve given away millions of dollars of my sports betting fortunes to people in my circle over the decades. One time, I wrote a million-dollar check to gift to my parents after going on one of my patented winning streaks. These are the luxuries in life I’ve enjoyed from my success in betting on sports. Now, I’m sharing my picks with you because I want to help you share into it. Unlike the typical touts who only sit back and say that they can win. I’m someone who actually win and have proven it. I remember the director at the Mirage sportsbook would tell me that I’m the best sports handicapper he’s ever seen in his life. And that’s a unique distinction about me that I really want you to take to heart. It also ties in very well to today’s theme where I want to answer the question: Is it wise to bet on picks from typical sports handicappers and touts? The truth is the typical tout in the industry do not win, and I never let what other touts out there to influence me on the games I’m taking. In fact, if anything, other touts’ opinions on games have an opposite effect where if I’m going against what the majority of what other touts are picking, I feel better about my plays. Take yesterday for example. One of my VIP clients became nervous about my pick on Northern Illinois. He asked me if he should pull out because a lot of handicappers were heavy on other side of the game, so much so that the line moved by several points. The truth is, the fact that so many other handicappers were on the other side of the game made me feel even stronger about my pick. As it turned out, Northern Illinois dominated their opponent from start to finish, crushing them by 22 points. I easily won the bet and the Round Robin, reeling in tens of thousands of dollars in profits. The problem with the typical touts in the business is that they tend to have a herd mentality. Sports handicappers don’t want to be oddball who picks one side of the game while everyone else are taking the other side. The Mirage sportsbook director would routinely tell me that I have the best instinct he’s ever seen for a sports bettor. He respected me on the fact that I don’t listen to anybody, and I don’t overthink. If I listen to anyone else, it always hurts me. I take what other sports handicappers in the industry say with a grain of salt because I know that the typical touts don’t win. I make my own picks and bet on them because I do win. What other so-called handicappers believe in are irrelevant to me. And that’s how I’ve found success. As you may know, I don’t win the conventional way. A large part of the $30+ million dollars I won from betting on sports is based off a mastery in recognizing patterns that form, and then riding those waves to make millions of dollars – that quick. I’m finally coming public with my picks because I don’t want to see you get burned by following other sports handicappers. If you’re going to put your money on the line, do it with someone like me who has a history of consistently winning millions, not just some tout who only sits back with all sizzle and no steak. As you may know, I don’t win the conventional way. A large part of the $30+ million dollars I won from betting on sports is based off a mastery in recognizing patterns that form, and then riding those waves to make millions of dollars – that quick. I really want to stress to you the importance of patience when betting on sports, and to not get sucked into an emotional rollercoaster ride. Don’t expect to win every single day with my picks. In fact, you should expect losing days to be the norm because to profit from one, you’d need to win a majority of bets from the group. But just like me: You cannot let these small losses bother you. As soon as I get in just one winning day like a day yesterday, you’ll see just how quickly and how easily he completely obliterates all the losses leading up to that day and jump far ahead in profits! In just one single day yesterday, I cashed out nearly $50,000 and skyrocketed up +182.9 units in just one day. That’s an example of what patience can bring you when you’re tailing me when I finally hit the start of my hot streak. And this is just only the beginning. I can’t wait to show you what happens as I continue my acceleration today. Right nw, I’m rigorously working in a process that could possibly get my back in action as the largest sports bettor in Nevada once again by 2018. I’ll keep you updated on this as it happens. I know that the more I bet, the more I can win. It’s my goal to continually bet millions of dollars on my picks every single week to show you what kind of winnings can be made from this craft when playing at the highest level. After cleaning out that sportsbook’s coffers to the tune of more than a million dollars (including a streak where I won over $800,000 in one run), my betting limits were lowered, and my relationship with that sportsbook turned sour. I have not stepped foot inside that casino again since. I knows I’m not very welcomed there.